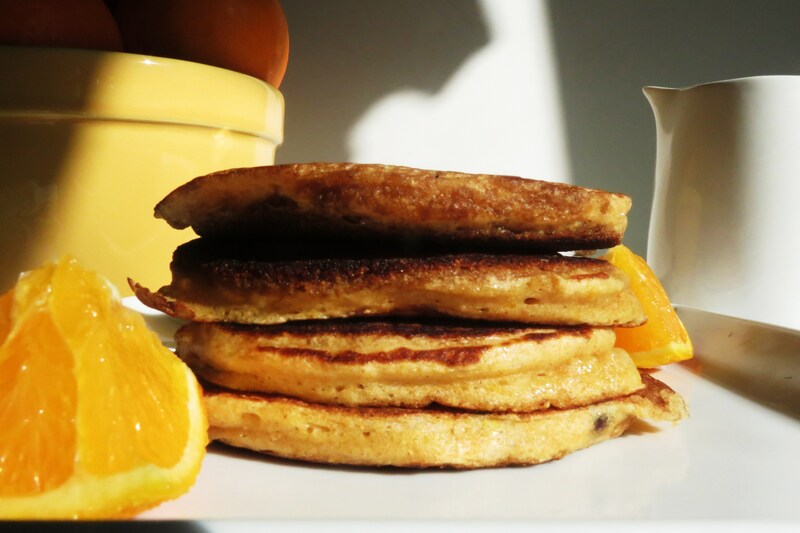 This weekend I made the most tasty pancakes using freshly squeezed oranges. The flavor of these pancakes are unbelievable. There sweet and the chocolate chips in them just add a little bit more to them. I was pleasantly surprised on how well they turned out. Check out my dramatic photo of them. My neighbor dropped off a bunch of oranges and lemons for me, and I thought I would make him my lemon bread with the lemons he gave me and I also made some orange bread too. I’ll post the recipe for the orange bread later this week. These oranges are the best oranges I ever had. I have been going orange crazy with them. I have been putting them in everything. Every time we finish up some oranges, I’ll go outside and there will be a bag of more oranges. I love these little surprises, so you don’t be surprised, when I post a bunch of orange recipes. That’s one thing I love about living in California, fresh citrus in the winter! 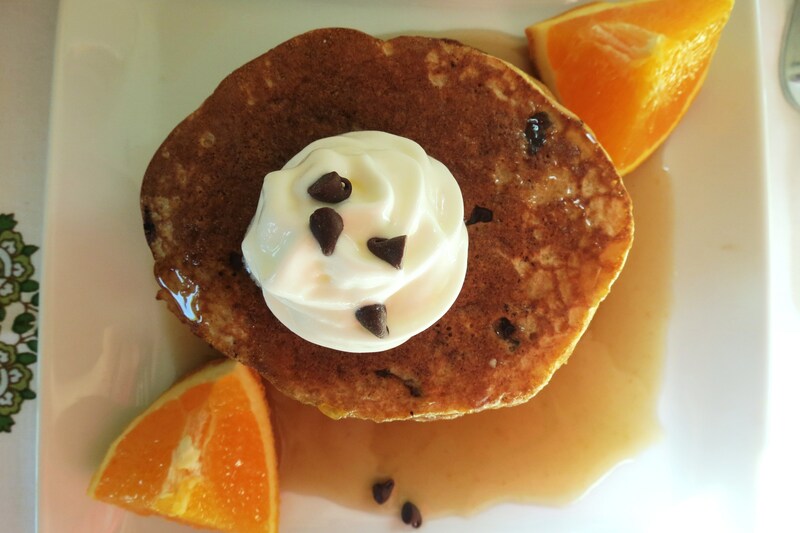 Only a few chocolate chips are needed in this recipe because the oranges are so sweet! 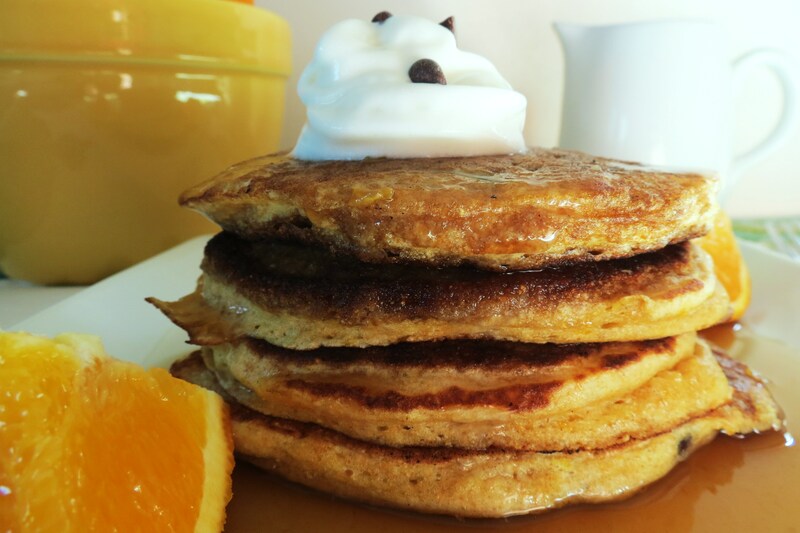 On these pancakes, I used plain, fat free greek yogurt because I really wanted the fresh orange taste. But I bet orange yogurt would be wonderful in this recipe if you don’t have oranges. I have to tell you, I really need to invest in a griddle. I have such a hard time flipping them in a skillet. Can you believe with all the pancakes I’ve made, I use a skillet. I just haven’t found a pan that I really like. I’m thinking of searching on amazon for one. I find the best kitchen utensils, pans ect… on there. I would love one of those double burner ones, but if I got one, I wouldn’t know where to store it. Do you have trouble storing all your kitchen goodies? I really, really would love a kitchen makeover. I’ve been asking for one, well over a year, but no such luck. The kitchen I would want would probably cost me a tiny fortune, but hey if your going to do it, you should do it right! I guess that’s why I haven’t done it yet. 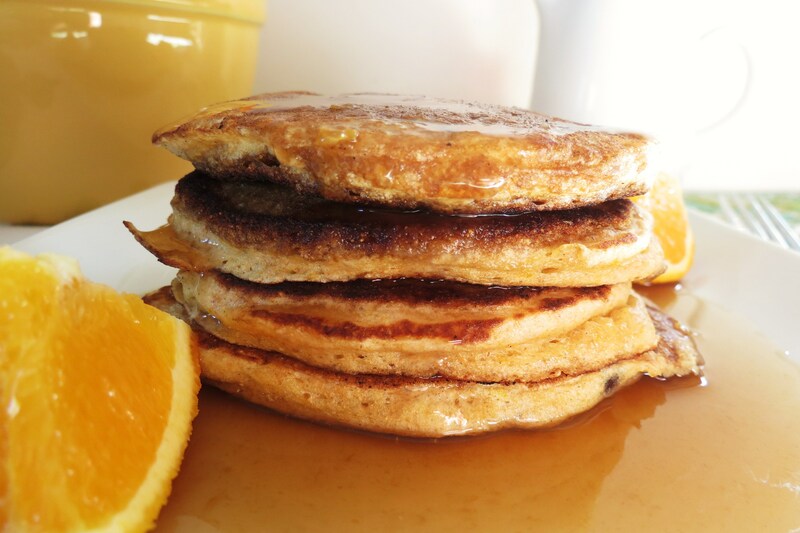 I also made a wonderful orange syrup to go on top of the pancakes. I used 1/4 cup freshly squeezed orange and 1/4 cup of sugar-free maple syrup. Wow, the syrup was amazing. Perfectly sweet with a hint of orange. They were a perfect match for these pancakes. 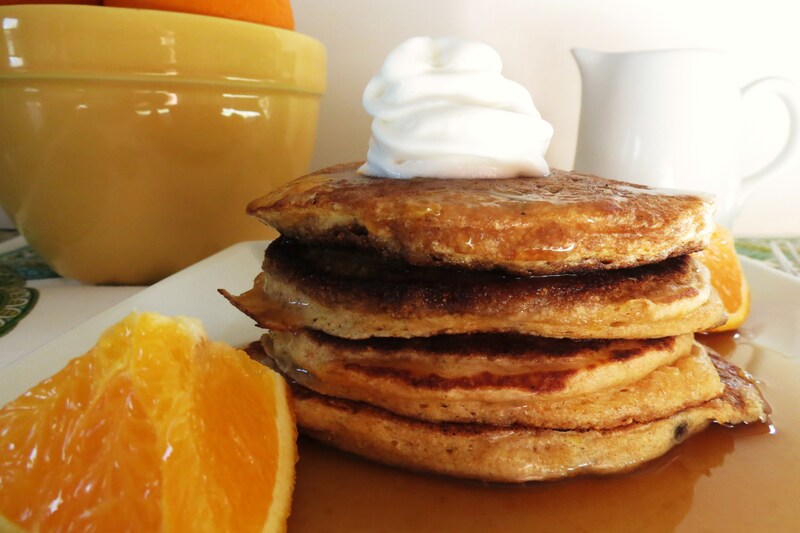 If you’re an orange fan, you have to try these pancakes. I made a double batch of them and took them to work this week. They are a perfect breakfast. Just heat in the microwave for 25 – 30 seconds and you have a wonderful breakfast. Oh, back to the syrup, it’s really good in oatmeal too!!! I thought I should point that one out! All I did for the syrup was warm it up in a Pyrex measuring cup for about 30 seconds. You gotta love the microwave. 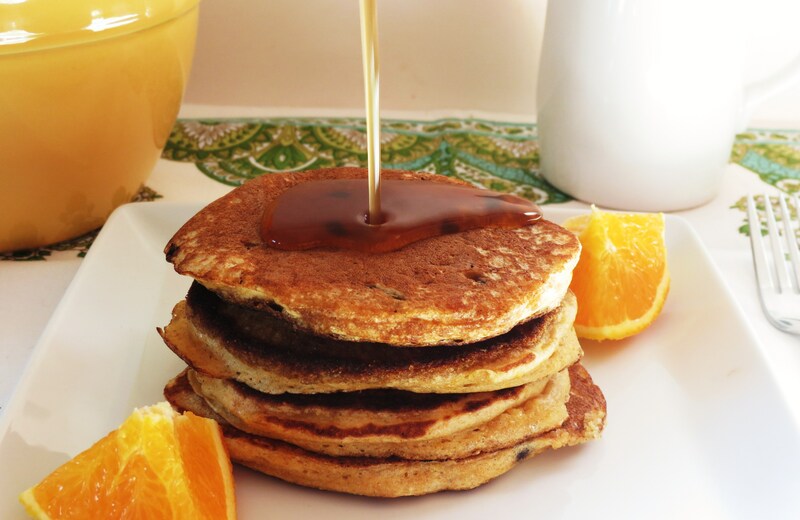 These pancakes are light, fluffy and sweet, but only sweetened by the oranges. Now that what I call Mother Natures perfect sweetener! Spray a non-stick skillet with cooking spray and place 1/4-cup batter onto skillet. Drop a few mini chocolate chips onto pancakes and cook till bubbles start appearing through the top of the pancake and then flip. About 1-2 minutes on each side. NOTE: Cook on medium heat and I spray cooking spray between each batch. To keep pancakes warm, heat oven to 200 degrees, line a baking sheet with parchment paper and when your pancakes are done place on baking sheet. Do not stack them. Add orange juice and maple syrup in a microwavable small bowl and stir together and heat for about 10 seconds stir and heat until warmed. Guess what this Sunday is? Daylight savings time! We get to move the clocks ahead 1 hour. Yah! That means we get an extra hour of daylight! That came quick this year. I love that it won’t get dark until after 6. This means summer is getting closer! I can’t really complain about winter, it was pretty mild here, not much rain and not bitter cold like it has been the past couple of years, but I am ready for summer, aren’t you? 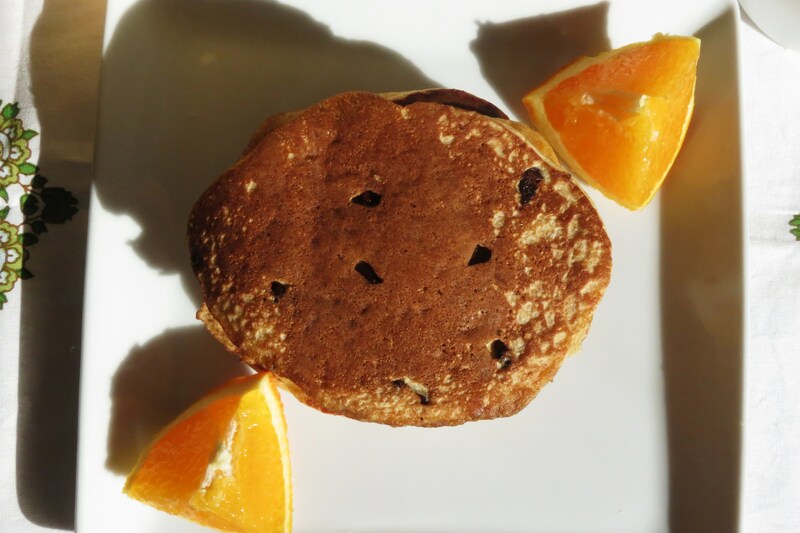 I hope you like this weeks pancake recipe! This was a wonderful one, I’m half tempted to make them for dinner tonight. I love these pancakes. I thought they would be ok, but I never imagined how wonderful and fresh they tasted. 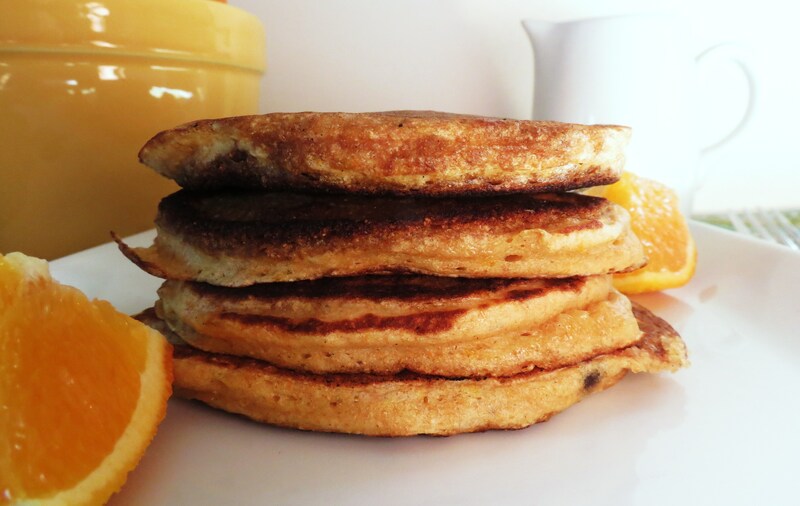 If you have oranges, make these pancakes this weekend. Un-freaking believable! Way better than I ever imagined!! Ok, here’s the part where I ask you for your vote. As some of you may know, I was nominated for Best Healthy Eating Blog by Fitness Magazine, and I would so love your vote! However I am thrilled and honored to be just nominated. I still don’t know who nominated me, but thank you so much, you made my day and I am truly happy that you think my blog is worthy of such a nomination. If you would like to vote for Peanut Butter and Peppers, please go here. Thank you!! Thanks for the head’s up about Daylight Savings! I’m SO ready for summer! I had no idea that we have to change our clocks this weekend. Wow…that did come fast. You know what else I’m ready for?? Your pancakes! They look perfect! Gorgeous pictures! It makes me want to eat those pancakes right now. Love the combination of orange and chocolate together-amazing! Thanks Laura! I’m really happy with these pancakes!! Wow..I can’t help thinking ‘If she added just a titch of yeast to these, they would have rocked the BBD #47 round-up’ 😉 They look AMAZINg, love the photo with the syrup being poured on top! The orange syrup sounds sooo good! Mmm, these sound vibrant and perfect for spring! I haven’t had orange pancakes yet, but I think I’d love them. Wow these pancakes looks great! I’m a big fan of the combination of chocolate and orange together. I work for Kamut international. I bet this recipe would be equally as tasty if made with Kamut wheat flour.